Even though I think textbooks are great for learning, it’s important to diversify your reading, especially for intermediate students and above. One way of doing this that I’m particularly fond of is to use Chinese textbooks written for native speakers. While being quite difficult, they are useful because they provide a unique combination of language and culture that is hard to find elsewhere. To make sure everybody’s on the same page, I’m talking about what’s called 语文 on the mainland and 國文 in Taiwan. This would be akin to studying English for Americans or Swedish in Sweden. The textbook authors assume that you already speak the language; they want to teach you more about written language, literature, advanced vocabulary and so on. If this is what you want to learn, using 语文/國文 textbooks is great! Written Chinese with some help and exercises – These books are meant to help students improve their Chinese, so they will introduce new language, discuss how it’s used and even give you exercises to work with. Since the target group already speaks Mandarin fluently, the focus is on written, formal language. 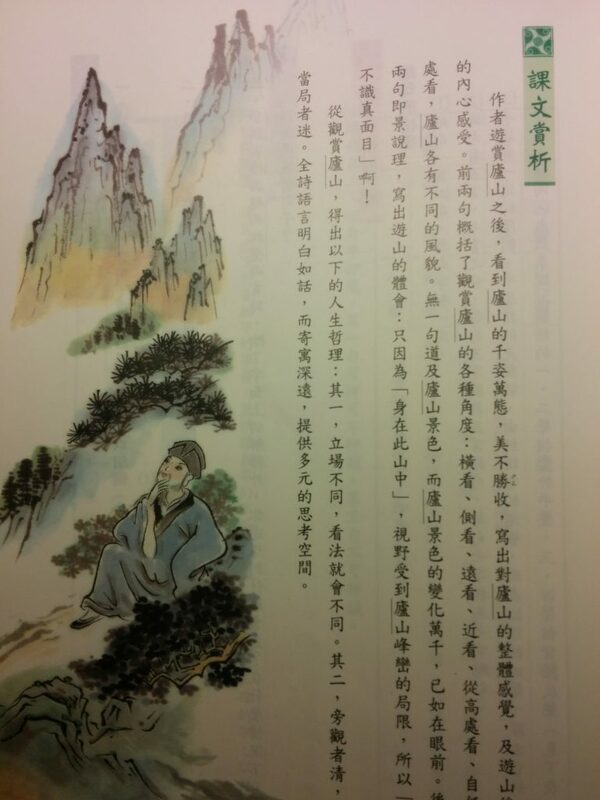 Learning about culture and literature – By reading the texts in 语文/國文 textbooks, you will learn what native speakers learn, which hopefully will make it easier to understand them and their society. Which authors are important? Which stories? You will also get introductions to both the authors and their work, helping you put them in context. A glimpse of what it’s like for them – I find it very interesting to see what and how native speakers learn to read and write Chinese. This includes everything, from the actual texts and language content to the way the books are structured and the underlying pedagogy. It’s also interesting to see how ideology and politics influence the content. 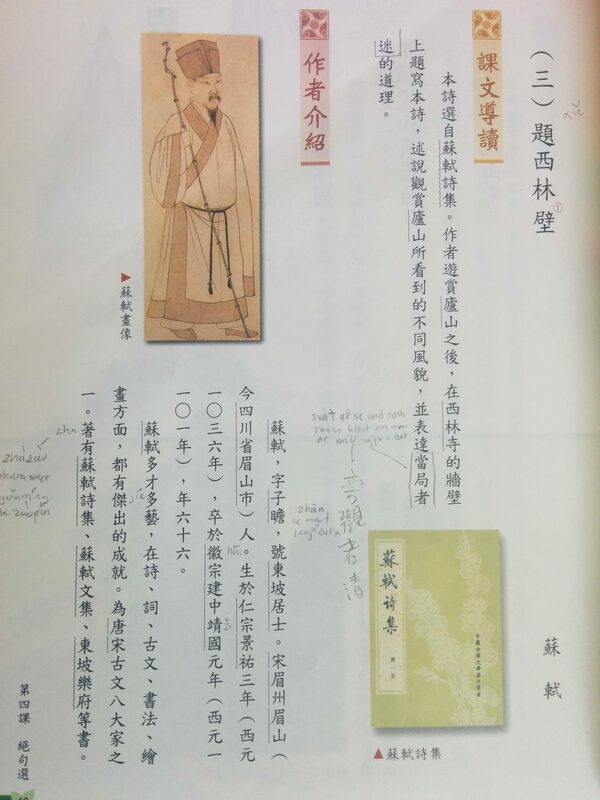 Baby steps to classical Chinese – Depending on the level of the book and when and where it was published, 语文/國文 textbooks usually include fragments of classical Chinese. Short poems, excerpts from the Analects and so on. These typically have some scaffolding in modern Chinese, which makes them a decent introduction to classical Chinese. Naturally, if you want more than baby steps, scale it up to senior high school. Many of the above advantages actually apply to other textbooks for native speakers as well, including in mathematics, history, science and so on, but that’s a topic for another article. They are too difficult – I mentioned this above, but it’s worth repeating here because it is by far the most serious disadvantage. 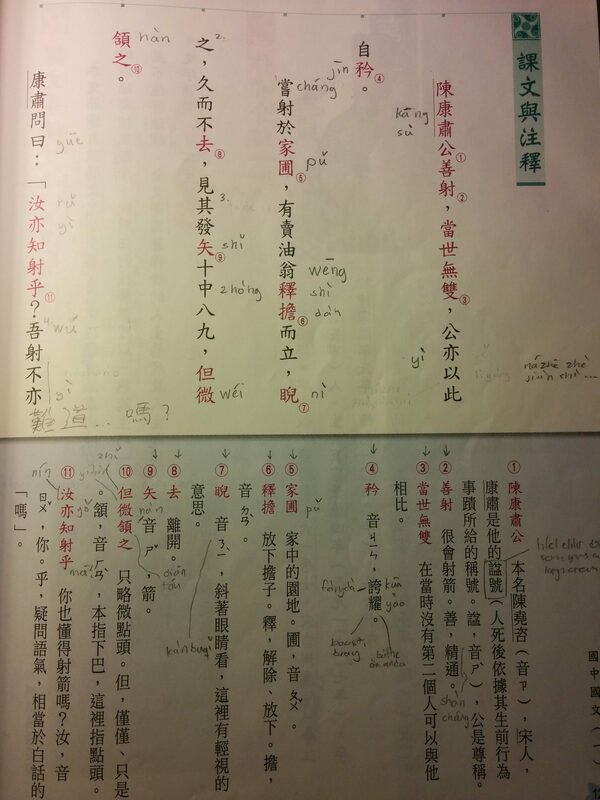 语文/國文 textbooks are really hard compared to the final book in any textbook series I’ve seen for foreigners. We’re talking way beyond HSK6 here, even if you go for junior high school. Your only way of adjusting difficulty is to choose books for younger kids, but these also tend to be less interesting. You can of course also skip particularly difficult parts (usually anything related to classical Chinese). They are not always helpful – I said above that using 语文/國文 textbooks is good because they offer some scaffolding in the form of footnotes, introductions and so on, but it’s worth keeping in mind that these are meant for young native speakers. This means that they aren’t always helpful for foreign adults. You can of course compensate for that by using your own dictionary or having a tutor guide you through the text, but it’s still a disadvantage. I haven’t used enough books to recommend one series over another. On the mainland, there are standardised books, but they differ between provinces. In Taiwan, there are a few book series in common use. I would suggest you get the most popular series where you live. The easiest way to do this is to go to any major book shop and ask for it. Buying online or from abroad is a lot harder and it’s probably easier to ask someone locally to buy them for you and mail them. I’ve learnt a lot from studying 语文/國文 textbooks and think they are in many ways superior to advanced textbooks for foreigners. They are also much easier to get in large quantities and a lot cheaper. If you’ve finished your textbook series and want to try something authentic, why not check out what the kids are studying? I’ve read the 小学语言课本 level 3 and 4 and I only can totally agree with you. On one hand you can learn a lot about Chinese culture and the way of Chinese thinking, which helps me to understand Chinese people much better. On the other hand, there are so many Chinese characters which an adult foreign Chinese learner will probably never use in his daily life. Still, I would recommend it to anyone who is seriously interested into learning Chinese. By the way, I miss the challenge of July. Have you stopped the challenge? I’ve just paused the challenges over the summer. We’re working on a new version of the site and I thought that taking a break and launching the new version after the summer would be the best way to do it. Regarding textbooks, I think what you say about non-everyday characters is partly (or even mostly) what makes these books difficult for second language learners, especially those who haven’t really mastered the everyday characters yet.